In 1955, the European Broadcasting Union created an international song contest whereby countries, represented by their respective broadcasters, would compete in one television show. The secret to the contest's cross-border mass appeal lies in a curious mixture of camp irony and mild controversy. Read about this year's Serbian winner and take a look at some memorable moments from the past. 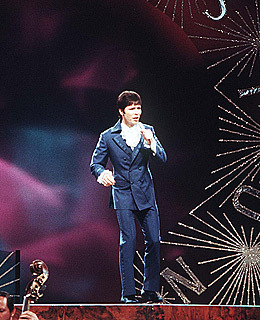 British legend Cliff Richard gets an early introduction to crushing disappointment when his signature hit Congratulations (still seemingly heard at every wedding and birthday party in the UK  must be a legal requirement or something) is robbed of victory. To make matters worse, he loses out to Spanish entry La La La, notable only for using the word 'La' 138 times. Richard reacts by releasing more records than one would think was feasibly possible, singing to the crowds during rain delays at Wimbledon  see you next month then!  and vowing never to set foot upon Spanish shores. Probably.